Renee – thank you for this. To be honest, I had no idea this had started so long ago, although I should have known. I ended up not teaching elementary school although that had been my training. I taught parent education, ESL to adults, citizenship to adults, and then became a school librarian. I should have been a librarian all along. I worked in a K-12 school. I allowed children to check out almost any books they wanted (a few older themed books were discouraged for young ones). I also said they could return them and exchange them any time they wanted. I still think this was the right thing to do. I believe so much of school has become rigid and unimaginative, dulling children’s natural inclinations to be curious. I tried as much as I could to allow them to explore their interests in my library. So I applaud you for successfully keeping away from leveled books. I also believe, as Piaget taught us, that we really don’t need to start teaching reading until age 7. I guess I need to moved to Finland. Yes! What matters is for kindergarten libraries to include a range of books. Children should be able to browse/peruse any book, easy, hard, at any time. 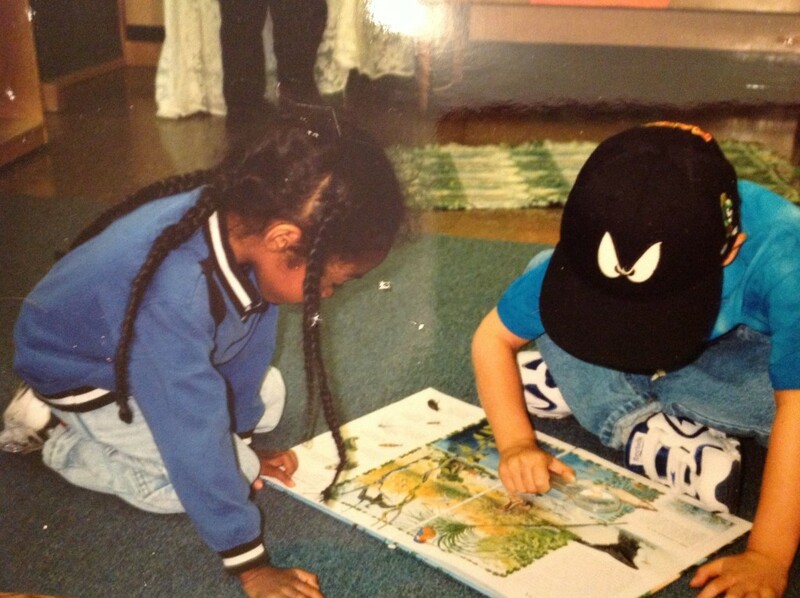 The photo, above, shows two children immersed in the book they’re looking at – that’s what we want to see in kindergarten. Libraries should be arranged by topic, so children can find books of interest. What matters is their interest. It makes sense to have baskets of Easy Reader books, at some point in the school year, and to have these arranged by difficulty. BUT these books should only be a very small percentage of available books. And kindergarten children should never, never, never be limited to choosing “just right” books unless they are choosing a book that they specifically want to use as Renee describes, above, to practice decoding. And what a lovely discussion Renee describes. I am in agreement with you 1000 percent. Our society has changed into a factory model where test data is the byproduct of education. Therefore, children cannot be given a moment to actualize themselves and develop into competent humans. I hate what education has become and fear if I were deciding today that I would not have become a teacher. So I reaffirm your Bah and raise you two other Bahs and a Humbug to boot. Thank you, Renee. I am glad to have found your blog. I am so lucky to have had the privilege of being a student observer and subsequent student teacher of yours twice! I never would have believed that education would have evolved into this fiasco that is about anything but children. Well said Renee! Forcing kindergarten students to use a leveled library is like eating genetically modified produce; it looks great on the surface, but once you sink in your teeth, the juiciness just isn’t there. Thank you for advocating for our youngest school children and the educators who work with them!